Spinning Babies® is an approach to childbirth that helps you get more comfort in pregnancy and ease in birth. The Spinning Babies® Parent Class highlights your baby’s active role in birth. During labor, your baby needs to pass through three levels of the pelvis. Learn techniques to help your pelvis and its muscles to support your pelvic levels. Together, you and your birth support person or partner can use these techniques before and during labor to help “make room for your baby.” Spinning Babies® reveals how baby can find optimal positions for labor, and make birth less painful, and even pleasurable! Learn more at www.SpinningBabies.com. Catherine Allen, Spinning Babies® Certified Parent Educator (SpBCPE), Prenatal Yoga Teacher of 20 years, and Certified Doula, is now offering Spinning Babies® Parent Classes in Houston, Texas. Catherine used the Spinning Babies® approach in her own pregnancy and labor and believes in its revolutionary philosophy for childbirth. It is an approach that encourages the birthing person to make informed birth choices and helps strengthen the bond between parents and baby. She offers semi-private, private, and FREE monthly classes to pregnant parents. 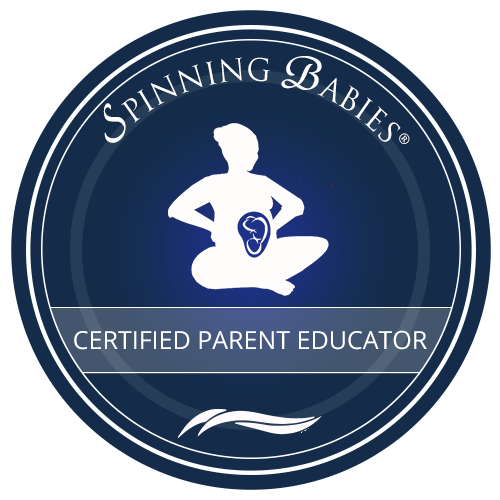 WHAT IS A SPINNING BABIES® PARENT CLASS LIKE? Each Parent Class is a fun and interactive 3-hour experiential class. You’ll be guided through a light and accessible prenatal yoga class to help you balance your body. Then you’ll learn additional body balancing practices, such as the Three Sisters of Balance, that are to be done with your partner or birth support person. You will practice specific labor positions that open up each level of the pelvis to make as much room as possible for your baby to descend and rotate through. After class, you’ll receive handouts and a special e-companion book to help you review and retain the information you learned in class. HOW DOES THE SPINNING BABIES® APPROACH WORK? The yoga poses, exercises and various techniques taught in the Spinning Babies approach help balance out the soft tissues in your hips. The state of your soft tissues is a major factor that influences fetal position. We believe that fetal positions are not random and that babies fit the space (i.e., uterus and pelvis) available. Thinking of the size of the baby or the pelvis is not enough. Birth anatomy can be flexible. Both the uterus and the pelvis have more available room when the muscles and other soft tissues are balanced. If you have excess tensions in the soft tissues, your uterus might be constricted in a way that reduces room for your baby to be positioned optimally. Fetal malposition or malpresentation often contributes to labor difficulties (e.g., stall, irregular contractions, excess pain, transverse arrest, pelvic floor trauma or tearing, etc.). However, when you release the excess tensions while supporting the excess looseness on a daily basis prior to and during labor, this could result in an easier birth with fetal positioning. WHY ATTEND AN IN-PERSON CLASS? If you have pain or tension in a yoga pose or exercise, Cat can work with you to tailor the pose to your individual needs. During the practice of labor positions and partner work in class, Cat can let you know if you’re doing it correctly and offer feedback where needed. Cat can answer any questions you have. FOR WHOM IS THIS CLASS? Second or third-time birth – No two births are the same. Cesarean Birth – Yes! The Spinning Babies approach can improve comfort during your pregnancy and help you labor with more ease (if you labor before surgery) and to recover from birth with more ease as well. Laboring/contractions are wonderful for helping your baby to produce crucial hormones for breathing better once outside of your womb. If you don’t have these materials, let Cat know. She will be happy to bring them for you to borrow. I don’t have a birth partner or birth support person. Let Cat know, and she’ll help you find a partner for the class. She will show you how to do these poses and exercises without a partner. You will still reap the benefits. I’m very flexible/I dance/I lift weights/I do yoga/I do the splits. Would I benefit from this class? Yes, you will! If you do a lot of intense body movement like dance, weightlifting, or yoga, or if you SIT a lot, you might have an excessively tense pelvic floor. The myofascial release techniques in the Spinning Babies approach can help balance your soft tissues by releasing excess tension, including in the pelvic floor, to help bring more comfort in pregnancy and ease in birth. My last birth was fast and easy. Do I need this class? No two births are the same. A prior “easy” birth doesn’t mean that your next birth will be the same. And it never hurts to use the Spinning Babies approach to counterbalance the tensions and stress that come with modern life. I don’t do yoga. Can I still do the Spinning Babies approach? Yes, you can. Catherine will teach you accessible and simple yoga poses that you can do. She will customize each pose or exercise especially for you. NOTE: Reservation is required to attend. Attendance is limited to 6 pregnant people and their birth partners. Please fill out the below form to request a spot. You will receive a response via email to confirm your reservation. If the class is filled, you will be put on the wait list.